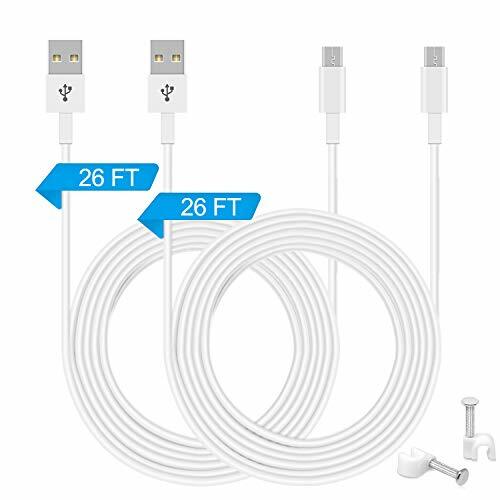 2 Pack 26FT Power Extension Cable for WyzeCam,Wyze Cam Pan,YI Camera,NestCam Indoor,Netvue,Furbo Dog,Blink,Amazon Cloud Cam etc,USB to Micro USB Charging Cord for Security Camera with Wire Clips Nails by FASTSNAIL at EISF. MPN: CL35-MS-1-1. Hurry! Limited time offer. Offer valid only while supplies last. About Our Extension Cable: 1.Made for Wireless Camera. 2.DurableMade of high quality materials, more stable. 3.Works as power and data cable. 2.DurableMade of high quality materials, more stable. 3.Works as power and data cable. 4.Extends the range of power up to 26ft from AC outlet. 1.Provide 12-Month Worry-Free Warranty and Unconditional 45-Day Refund & Free Lifetime Technical Support. If you are not 100% happy with the cable for any reason, please contact us. No questions. No charge. No kidding. 2.FastSnail Tech products have been well tested before delivery, but we cannot 100% guarantee the items when shipping to you. Any problem please feel free to contact us through Amazon Email System and we will do our best to serve you. Premium designs. Lifetime warranty. Note: Not include Security Camera, cable only.